The Rhymes to Read series by Franklin Watts are perfect poems for children to read alone or read aloud. 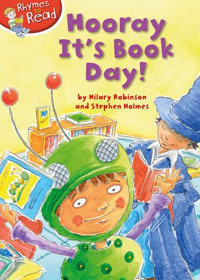 Other popular books by Hilary Robinson in the series include How To Teach A Dragon Manners and The Royal Jumble Sale. I love visiting schools and libraries on Book Day – especially when the children dress up as their favourite characters and it’s even more exciting when the teachers join in. I remember one teacher dressing up as Superman and another as the dog, Nana, from Peter Pan! The teacher in my new book "Hooray! It’s Book Day!" leaves lots of clues about the character he is going to dress up as – but doesn’t reveal who he is until right at the end.